A new interview and behind-the-scenes footage reveals that the animated watchfaces on the Series 4 Watch — Fire, Water, Liquid Metal, and Vapor — were actually shot using live video, despite looking like digital effects. "It's more of a story about the design team. We could have done this digitally, but we shot this all in a studio," Apple's VP of User Interface Design, Alan Dye, told Cool Hunting. "It's so indicative of how the design team works — bringing our best and varied talents together to create these faces." 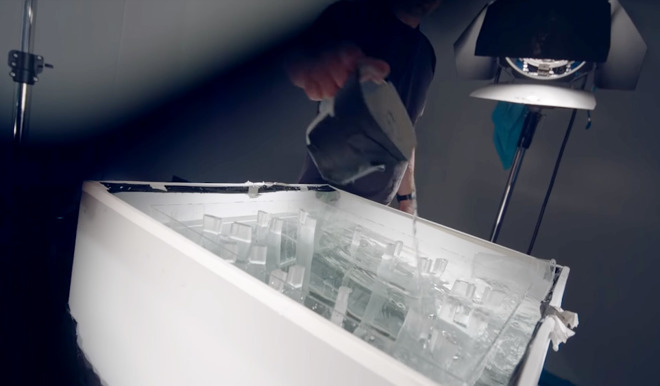 The behind-the-scenes clip shows that Apple's video crew used a vertical camera setup paired with a physical frame meant to simulate the dimensions of the Watch while also constraining the fire, water, and other materials shot towards the lens. The Series 4 uses a larger OLED display than its predecessors, with thinner bezels. The new watchfaces are meant to highlight this, as effects rush toward the edges of the screen. The same faces are also available on other devices running watchOS 5, though they don't fill the entirety of the screen. Check out AppleInsider's hand's on with all the new watch faces. Preorders of the product are still underway ahead of Friday's official launch. The first reviews are already beginning to appear online.